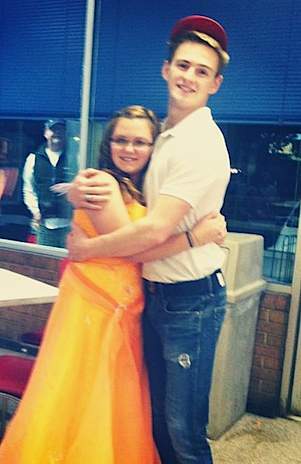 A gallant young man working at a burger joint saved a heartbroken teen from one of the most humiliating nights of her life as she was stood up on prom night. All dressed up in a gorgeous orange gown, Kelsey Baker would have stayed home after getting the dreaded last-minute text message, but her mom dragged her to Jim’s Hot Dogs and Hamburgers to show-off how she looked to her aunt. Bryan Hayes, 18, was working that Saturday night.